I think that writing a coherent review currently is impossible. It’s been a really long time since a book made my heart speed up, my breathing shallow because I was so engrossed. It’s been a really long time since I thought that a writer’s writing style is really beautiful and went out of my way to tell others that. It’s just been a while since a book managed to truly blow me away and make me love it so much. 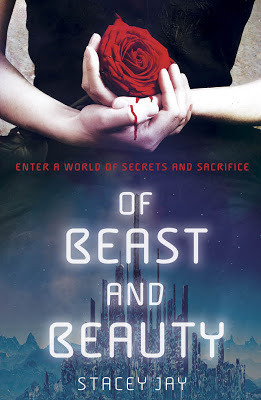 OF BEAST AND BEAUTY, the first book I’ve ever read by Stacey Jay, managed to do all that and more. I can already tell that this book will stick with me for a while. The intricacies of this new world was fascinating. They easily engross you and hold you captive throughout the duration of the book--making it an incredibly quick and enjoyable read. It’s set in a dying world where domed cities must make royal sacrifices every thirty years in order to ensure the continual thriving of their people. Isra, the blind future Queen of Yuan, is set to be the next sacrifice to allow her people to continue to live. The domes are necessary to cut the citizens off from the evils of the outside world and the disfigured race that lives in the desert. The Monstrous are beastly people with poisonous claws and they must be feared, but when they break into Yuan and one of them murders the King, everything spirals out of control. They leave a single Monstrous prisoner behind named Gem in order to ensure peace between the two races, but he is unwelcome by all except Isra who is strangely fascinated by her new prisoner and eventual friend. A lot of the amazing world-building was displayed through personal anecdotes and the telling of old legends from both races, and I found this to be a welcome, unique touch that kept my interest without having to info-dump. This also allowed the mystery of Yuan to be unraveled in a really unique way that left me flipping pages as fast as I could. I think the strongest point of this story was the characterization. Both Gem and Isra live in two completely different yet equally dying worlds, and they both will do anything required to save those they love. But, in the end, they both have the biggest hearts of gold. They can plan to do terrible things but never follow through with it. They’re both just so good, and I truly truly loved that. Isra never allowed her blindness to hinder her. In fact, it just made her stronger. And Gem was proud of who he was, even if the Smooth-Skinned people that Isra ruled believed he was disgusting. His form was beautiful and his people were beautiful. In his eyes, everything somehow was beautiful. I liked the hidden messages that such a thought process shared. And I also loved the side characters, especially Needle, Isra’s loyal maid, best friend, and dress-maker despite being born mute. Bo was a unique side character as well, often warring with himself about what is right since he tended to simply feel for so many people. He had a good heart, he just didn’t know how to manage everything. This book is told in the altering perspectives of Gem and Isra, with a few chapters in Bo’s perspective thrown in. I normally would think his perspective was completely unnecessary, but he added a lot of back-plot to the story and summed up all questionable plot lines. Although, I have to admit, while I enjoyed his voice I did not love it nearly as much as I loved Gem and Isra’s. And, while this book has so much more to it, it’s still a BEAUTY AND THE BEAST re-telling at its heart, meaning that the romance is important. And, damn, can I say that I love love and this love story. It was slow-going and passionate all at once--the way a love story should be. And the BEAUTY AND THE BEAST interpretation was great. It added all the more meaning to the words “beastly” and “beautiful” and made me smile endlessly while reading the epilogue--an epilogue so sweet and perfect that I never wanted it to end. While I couldn’t have asked for a better story, I was saddened to turn to the last blank page because I grew so attached to Isra and Gem. Even now, I don’t want to leave them behind just yet. I don’t know what else to say about this one aside from the fact that it blew me away entirely. I can’t think of a single piece of criticism because I did love it so much. I recommend this book to anyone willing to read it. Those who love fantasy re-tellings, those who love an amazing romance, those who love something different and unique or a book littered with fascinating political intrigue and dark unknowns lurking beneath the surface. This is a book that could be universally loved and I truly hope anyone who picks it up will love it as much as I did. To put it simply, this book is a must read of 2013, no questions asked. I'm so excited to read this book! I love Beauty and the Beast retellings and this one sounds so unique. Great review! OOoh very nice review! Been seeing a lot of this lately and now I am definitely curious. I tried reading one of Stacey's adult books but didn't enjoy it. Haven't read her Romeo and Juliet books but they did catch my eye at one point. Might try this one though because I LOVE Beauty and the Beast and the fact that this one was so memorable and touching for you is making me think I need to get this one! Great review! I've seen a lot of reviews about this recently but I think yours touched me the most. I love retellings but the complicity of this new world sounds even better than the usual retelling. Beautiful review! I love characters like Gem. Many books lack characters with such optimism these days and I'm glad to know there's one here. I can't wait to read this book. I really like the Beauty and Beast storyline and I love when authors twist that plot to add new pieces to it. Wow... I need to get my hands on this book! This review is amazing. I am going to have so much trouble reviewing this book, it's just too spectacular for words.